Just spending some time in Norway this weekend, so the Scottish stuff will take a back seat for a short while. If anyone has any Scottish reports for this weekend, please post them and I’ll set them up. Hope to have some ice fall climbing information tomorrow. The weather here is cold and plenty of snow, but as we arrived in the dark I’m not sure how the ice is yet. Along the road it appeared to be forming up well. Did point five with Duncan Paterson yesterday. We started very early(i.e. 4 am walk in) to be the first team. It was very windy and lots of spindrift was coming down on the approach so we wondered whether it was possible. Good water ice which takes screws well in the lower half. We climbed the hard bits in two pitches (first on rope stretch) and so the Rogue pitch came a bit unexpected because I thought it would be at least pitch three. However, it was good climbing and I managed to place two screws near the cave and one higher up. We were both climbing on leashless Taakoons which makes placing ice screws much easier. Big cornices on the Ben at the moment but a traverse to the right got us out of Point Five. It cleared up during the afternoon and there were still lots of climbers around. Many gully lines seem excellent at the moment, Curtain is forming well. PS: These cornice pictures were taken on Quickstep a few days ago by David Talbot. Brave man! The Point Five Gully cornice could be similar. 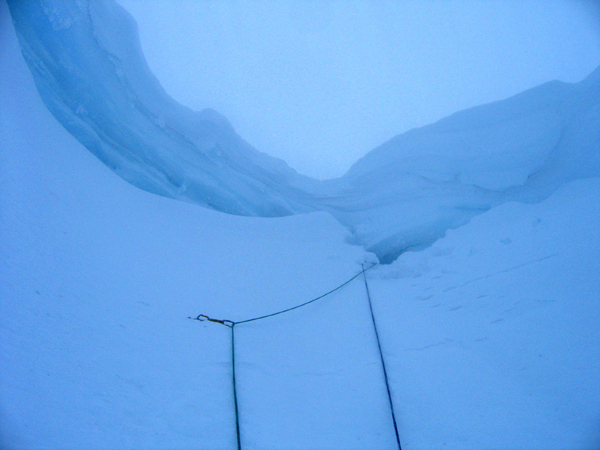 Avoid the Point Five cornice to the right and start heading in that direction well below it! The fourth picture today shows Fawlty Towers, which is low down on Tower Ridge, just to the right of the Douglas Gap Gully West. It is a very good area to climb on when conditions high up are either hazardous or too tiring, or you are just looking for a short day. 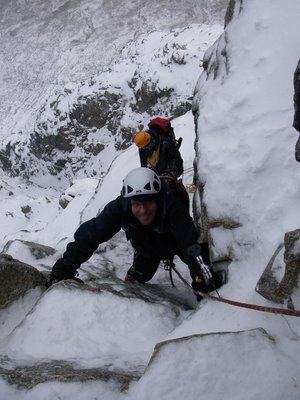 Descent is easy by one abseil towards the easy lower slopes of Observatory Gully on the east side of Tower Ridge. Another similar area to climb is on the First Platform of N.E. Buttress. The climbs are harder here and descent is best by two abseils, either down the route of ascent or down Slingsby’s Chimney. 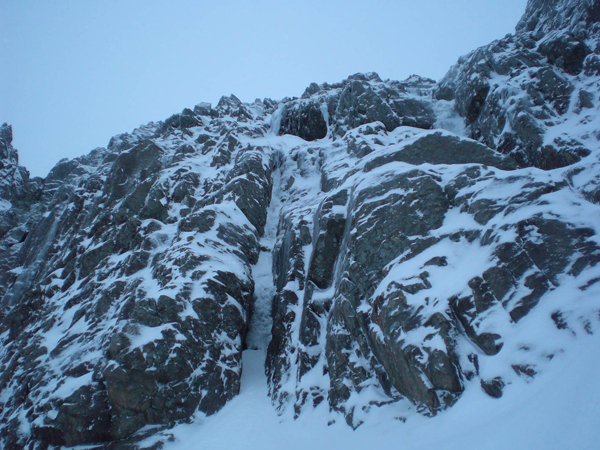 Alternatively try some short ‘sporty’ routes on Moonlight Gully Buttress. Thanks to David and Henning for supporting this site with some great shots. If you want to post anything please feel free. I moderate what goes on to these pages, warts and all usually! From a moonlit, starry night, just now! Plenty of deep unconsolidated snow on approaches to the routes on Ben Nevis. Today was a capital day for sunsets and decent weather out west. It was a little gloomy over in the east, but the skies cleared around Loch Laggan, Creag Meagaidh area. Looks like some milder weather coming through off of the Atlantic blocking high pressure. 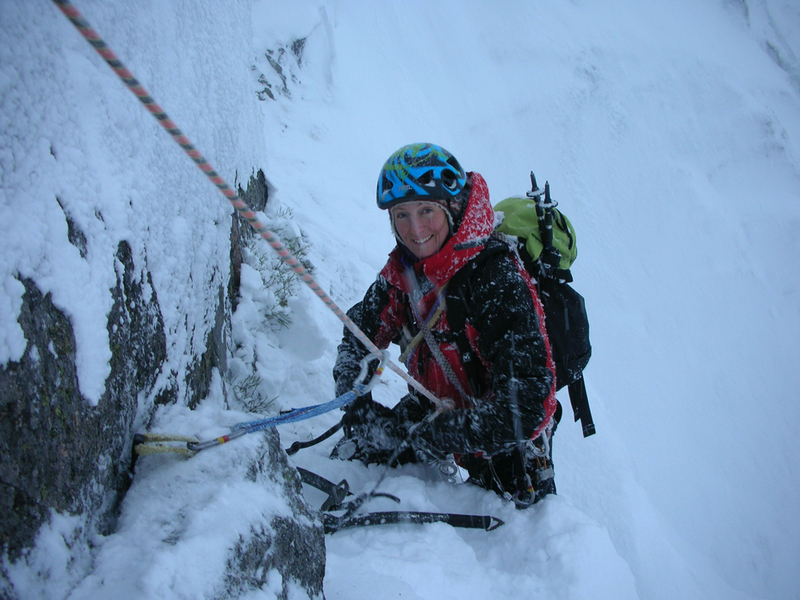 Plenty of smiles on climbers faces on Aonach Mor and Ben Nevis today, especially those who benefited from the good efforts of Plas y Brenin trail-blazing squads in Number four Gully. Thanks folks. Good to see you earning your ‘corn’! One guest back to the bunkhouse from the Aonach Eagach said the snow was very deep in places, making for some hard going on the ridge. We are now full this weekend, but have some space into next week. The weather for the next week or so looks to be okay with reasonably low temperatures. It would be good to get a little thaw, followed by some frosts to firm things up a wee bit. The ice is good though and plenty to go for. Thought I’d give something back to your great site. Don’t know if you’re interested but we had a great weekend on The Ben.We ended up doing Quickstep V on number 3 gully buttress, the first hard pitch was in good nick but the basin was really snowy and corniced. I had a fun time peddalling on powder to get into the cave below the cornice then it took an hour to get out. High winds and spindrift were also making things difficult on Sunday. Lots of powdery snow building up and I heard of at least one avalanche in Corrie Leis. Loads of debris in the bottom of 2 gully. Completely different from yesterday with low cloud and drizzle at lower altitudes, whilst snow and blustery wintry showers pushed through on the hills. One team back so far, had an ‘Interesting’ time with a one-axe ascent of Curved Ridge in Glen Coe. North Buttress on the ‘Buckle’ was also in belting nick according to the BMG Training Course. Another group back from Aonach Mor praised the quality of Left Twin today as well. Had a couple of great days out in Glen Coe and Carn Dearg. Both Dorsal arete and Ledge route had lots of fresh powder on them. Quite hard going at times. 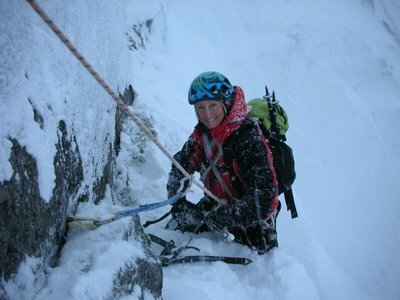 Attached a photo of the better half Kerry finishing up Dorsal arete-her first winter route! Big smiles all the way! Very icy and still this morning with freezing at sea-level. The day turned out to be a ‘stunner’ with plenty of cold winter sunshine and blue skies. One group were out on Stob Ban digging snow shelters and they found plenty of deep snow to excavate. This same snow proved heavy going on the East Ridge of the mountain. It certainly appears that although the ice climbing conditions on Ben Nevis and elsewhere are in good shape, the general approaches are deep in unconsolidated snow. The answer here is to start thirty minutes after everyone else and use a well-broken trail! 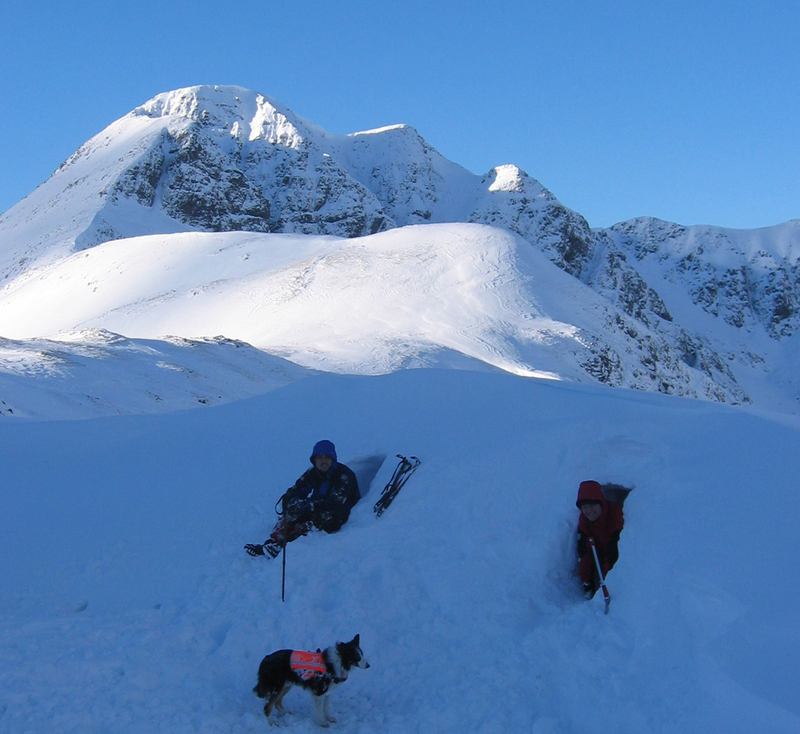 The Northern Cairngorms avalanche report brought a tear to my eye this evening. It ‘Comments’ that observations were difficult due to poor visibility:))) Who wrote that? I thought these guys were capable of reading snow structure in any conditions? Maybe the fact that they have no snow is the real message, and that is why it is hard to observe!! Just in case they have forgotten what it looks like I have attached a picture of some white stuff from the Outdoor Capital of the UK. Taken today below Stob Ban. The comments refer to any visible avalanches seen that day, and since the inception of SAIS they have used that term when visibility is bad and they cannot actually see if there has been any visible fresh avalanches that day, it is nothing to do with the observations of the snow structure at the pit site and its more to do with viewed avalanche activity. Anyway, I am sure you are just trying to wind us up! You must have powerful binoculars if you see the Ben from that desk of yours!!! 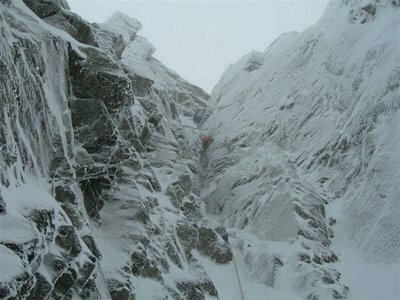 Attached is a photo of a nice new route we did today (23rd Jan) in the wonderful Cairngorms! Lots of old avalanche debris walked through on the approach! Take care, hope life is cool with you guys over there, glad you have snow, must be a bit of a novelty. I guided over that way a couple of weeks ago and was impressed by the blanketed out crags. Today was dry and cloudy with snow showers pushing through. Lots of new snow in Observatory Gully made for hard-going on the approaches to climbs. Teams out on Gardyloo Buttress (Smiths Route), Indicator R-Hand and Hadrian’s Direct. Also Two-Step Corner and Winter Chimney had ascents. The cornice on Two-Step Corner is passable on the right. Bear in mind the report came from a two metre lanky climber! Thanks to Stu Macdonald and Will Woodhead for the details and pictures of Winter Chimney and Two-Step. Reports from Aonach Mor East Face were positive, especially on Morwind. Plenty of skiers up enjoying the good start to the season out west. Stob Coire nan Lochan in Glen Coe was good, and well frosted up on the buttresses. With the wind swinging into the North-East the Cairngorm may see an improvement in snow cover. However, for the time being the best conditions appear to be over this way. The snow cover is sufficient for some good ski touring on the Grey corries as well. Plenty of space in the bunkhouse for those of you looking for accommodation this week. Certainly, from a distance Ben Nevis appears to have plenty of ice. Careful scrutiny of this picture shows build up on Orion Face and Hadrian’s Direct. The initial pitches of Minus Two Gully look complete and when the cloud lifts there is plenty to look at. Even Vanishing Gully looks as though it is forming. A pair of good binoculars are a wise investment for climbers on the west coast. The day started with rain showers low down, but it has been snowing on the tops and some ‘beefy’ wintry showers have moved through during the day. I’m not sure that it was such a good move for some of our guests to go over east today to get away from the rain. 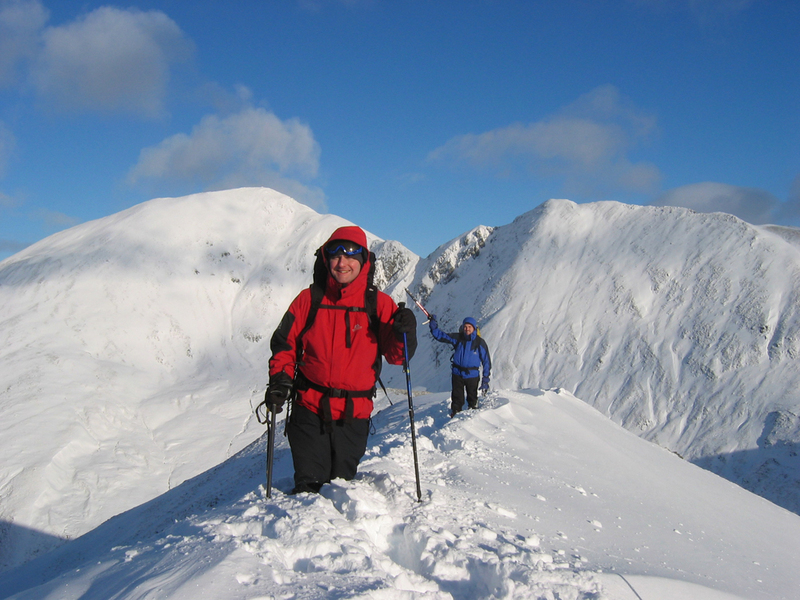 Anyone out there with on-the-spot reports might like to verify conditions elsewhere and on Ben Nevis & Aonach Mor. Plenty of snow over the last couple of days. Yesterday was in fact a very calm day, compared to further south. Snow is now well below 600 metres. Today we have had a gradual thaw, but this will no doubt aid the process of consolidation. The cornices and avalanche hazard will need some respect over the weekend. Our place is full this weekend, but plenty of comfy beds next week. Solid conditions today after a good overnight frost. 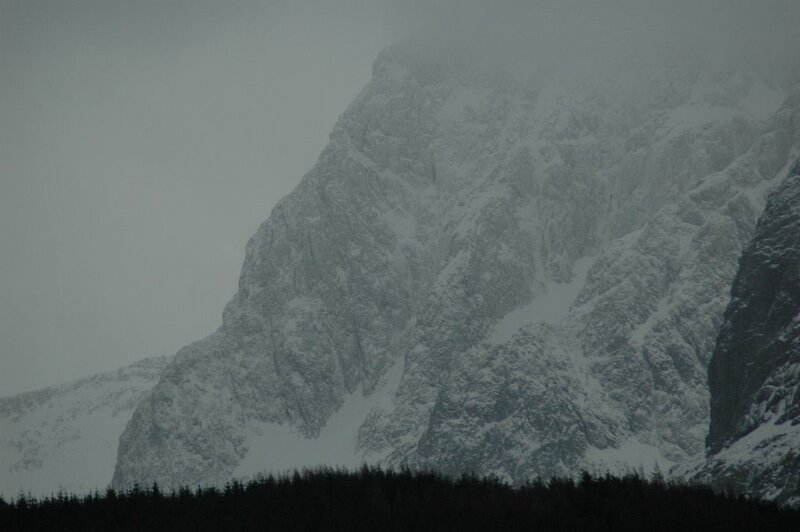 Reports from both Ben Nevis and Aonach Mor confirm that there is plenty of snow around. 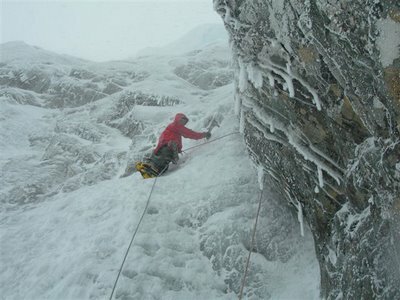 The area south of Easy Gully on Aonach Mor is actually banked out with less ice than in recent years. This just goes to show how much snow we have been getting over on the west coast. One team out on Morwind (see picture) had a great day and it looks well filled in. 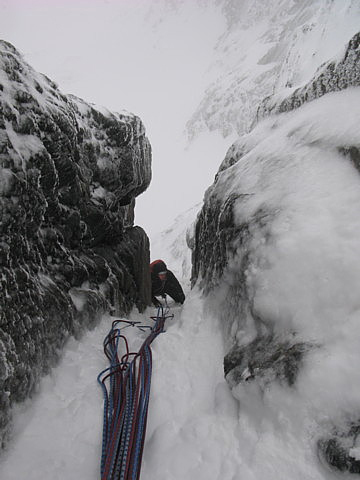 Another report from Garadh Gully was very positive with evidence of good firm snow and plenty of ice. The next couple of days look stormy, but cold, so expect more snow on the high tops. Plenty of snow forecast through the rest of the month, so it is looking good. If only the wind would drop back a little, we could actually get out and enjoy it. Unfortunately the forecast suggests no let up in the windy conditions before Saturday. At least we seem to be getting one good day each week and the conditions are building as each storm passes through. Be thankful for small mercies! Thanks to Nick Carter and the Pentax Optio WP for these pictures, above and below. And another report below to show the difference in snow cover between west and east just now. Also, the latter part of the month looks set to get much colder. When that happens the snow/ice on Ben Nevis and Aonach Mor should turn even better, so long as it’s not buried. Check out the Metcheck home page (link above) for more details. It looks good. Tria and I went to Coire an t-Sneachda today after sitting out the weekend, and were rewarded by hitting the weather window square on the nose– all day we had blue skies, minus 2, freezing level about 2500 feet. The only thing missing was snow. There wasn’t none– the gullies had a bit in them, but there was less on the way up the corrie than I’ve ever seen in January, and most of the slabs on the route we’d intended to do (Fingers Ridge) were pretty black. So we avoided the slabs on the L, and went R up Red Gully instead. It was surprisingly hard in the conditions– not banked out at all, and with two very steep sections of pure water-ice in the first pitch. Anyone who goes there before it all changes again should expect a meaty grade IV, not a II/III. The second pitch was more water-ice and still not much neve, but less steep. 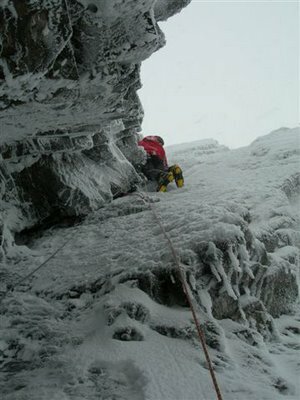 For the third pitch we headed left across mixed ground, put the axes away (but not the crampons! ), and rock-climbed a fifteen-foot vertical wall of not very snowed-up rock on huge holds. This got us on to Fingers Ridge at last, just below the Fingers themselves and the short sharp granite slab that tops out the route. Up there there was sunshine on our faces, and no snow or ice at all on the rock, not at least on the E-facing aspects. With the sun, and the predominance of rock and water-ice over snow, it was more like being in the Alps than in Scotland. Finished the day off with a quick visit to the top of Cairn Gorm then walked out down the White Lady (which wasn’t white at all, unfortunately). The guidebooks are right about loose rock on Fingers Ridge. Climbers beware. The cold weather is on its way folks. Most weather sites are predicting much colder weather over the next couple of weeks. We still have plenty of snow on the west coast, it’s just that the wind and stormy conditions have not been very pleasant. These pages will be changing to BLOG management in the near future, but the content will remain as before. Let me know if you have any problems, whilst I’m getting my head around the new software. Watch this space. Just been up on the ben, its not looking too good at the moment. Freezing level appears to be much higher than forecast. Ice hanging in at the top of the curtain. Will be good if we get a freeze..
Two or three other groups coming down from Ben Nevis thought the weather could not get much worse up there. One pair even got as far as the foot of Green Gully, before turning tail! The river crossing below the hut was seemingly…” very interesting”..
Another extremely wet and windy day today. Some hope appears to be over the horizon. Explore Metcheck at the link above and evidence suggests, colder and less wet and windy weather as January progresses. Storm force winds and snow from 600 metres will be stopping any realistic activity on the hills today. Yesterday was fine, as see from the tranquil photo taken whilst walking the dog! Just goes to show how quick, weather systems can kick in. They all came back with tales of huge sunsets, solid snow and smiles. The routes on the North Face of Ben Nevis look in good shape. It’s just a shame tomorrow and Friday sound dreadful on the weather front. The weekend looks better, so head north for a ‘wee’ look. Today is the best day this year, by a mile! Plenty of blue sky and ‘beefy’ wintry showers pulling through. 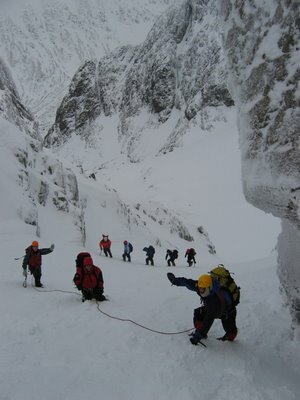 Teams are up the Ben Nevis, Ledge Route and hopefully back later with some good photos. Yesterday they were out on Buachaille Etive Beag in Glen Coe and were pleasantly surprised by some decent weather. The ridge, as can be seen in the photo has been stripped, with some soft snow left in place. Last night was clear and frosty, so a lot of consolidation will have taken place. Certainly the avalanche hazard level came down very quickly as the weather dried up and cooled. As always though please be aware of the odd pocket of wind slab lurking behind a sheltered spot in any gullies. It only takes a very small slide to knock you off your balance. bigger and sooner than we had understood so we breezed right past it. Anyway, next time! 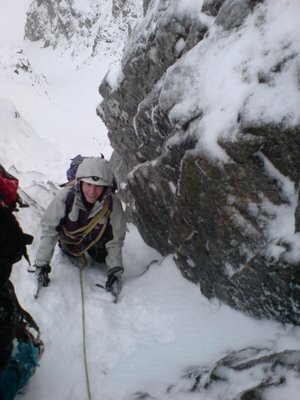 Lots of snow in the Gully, was cold enough too and that day it was definitely freezing above about 800m. Top 3 inches were shifty but for the most part the snow pack was stable. And as you said, definitely a really good build up in there.Good photos too, visibility was really good out of the spindrift and clouds. 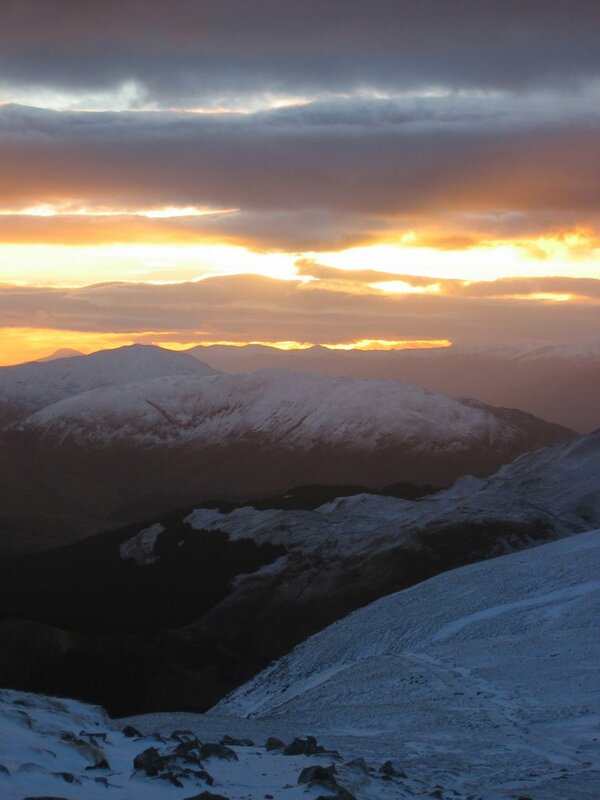 Thanks for the info resource, let me know if you ever want a Ben Nevis AT ski partner.